A great sign of progress are business grants used to stimulate economic growth, and IA learns biometric database. Weapon caches continue to be uncovered and criminals killed or captured. BAGHDAD – Iraqi shop owners received grant assistance April 20, after proving the money would be put to good use renovating their businesses. “Today we made final payments for microgrants to property owners in the Haswa area,” said Maj. Eric Kerr, 415th Civil Affairs, attached to 4th BCT, 3rd ID. 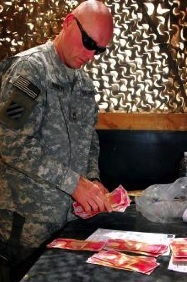 Kerr also works with the brigade’s embedded Provincial Reconstruction Team (PRT). Kerr said the grants were issued to stimulate economic growth. “It’s basically an economic renaissance on that little area of Haswa.” Kerr said the recipients got 25% of the funds up front, and after the progress of their renovations were checked, they received the remainder. Most grants requested were from medical personnel and doctors hoping to bring back pharmaceutical shops and doctor’s offices to the community. Other types of grants were for a law office and a carpenter’s store. Maj. Eric Kerr watches as a local store owner signs for his microgrant. Sgt. 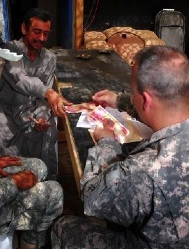 1st Class Mike Nunnelee, Co C, 703rd BCT, counts out money for a microgrant April 20. CAMP VICTORY – Soldiers from 1st Sqdrn, 33rd Cav Regt discovered a weapons cache in Yusifiyah, April 21. The cache included 34 RPG rounds, an AK-47 and a box of PKC rounds. Soldiers from 1-33rd Cav. Regt. discovered a weapons cache. BAGHDAD – Iraqi National Police working in the Rashid district of southern Baghdad, seized a weapons cache and detained a suspected criminal during a security patrol, April 20. Conducting simultaneous raids at 2 different sites, 2nd NP Div. officers captured 2 heavy machine guns with 1,800 rounds, a sniper rifle and a RPG launcher, and detained a suspected criminal operating in the Risalah neighborhood of West Rashid. The IA soldiers also detained 2 suspected criminals during an early morning op in the Saydiyah community of Rashid. “Thanks to the valiant efforts of the Iraqi SF, the Raider Bde continues to apply pressure to the enemy to provide a safe and secure environment for the Iraqi people,” said Maj. Dave Olson, the spokesman for the 1st BCT, 4th ID, and MND-B. ABU GHRAIB – Elements from 1st Bn, 21st Inf, 2nd Stryker Cav Regt, “Gimlets” detained a suspected criminal in the Abu Ghraib area west of Baghdad, April 22. BASRA – Iraqi Soldiers learned how to operate a biometric cross-match database at their headquarters in Basra, April 17. BAQUBAH – MND-North Soldiers killed 6 insurgents in a fire fight near a mosque in Kalaf Al-Hasun village, Diyala province, April 21. 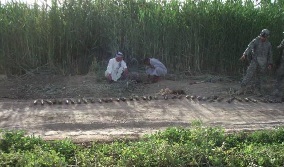 During a cordon and search of the village, approx. 20 km southeast of Hamrin Lake, a truck loaded with several personnel carrying AK-47s and RPG launchers approached the position of 4th Pln, Troop F, 2nd Sqdrn, 3rd ARC. The Soldiers fired a warning shot to halt the vehicle. The personnel in the truck fired on them. The Soldiers returned fire on the vehicle, and the passengers ran into nearby buildings, including a nearby mosque. In the ensuing battle, 6 insurgents were killed. Three suspects were also detained in the incident. A resident of the Somer neighborhood speaks with 1st Lt. Michael Smith about the local security situation in Mosul. Smith is assigned to 1st Bn, 8th Inf Regt.